As I write this I am aware of several funerals recently or about to take place. One died of cancer. Another committed suicide. The first will be cremated and a small memorial service will be held. The second service was held yesterday where the preacher was so insensitive that the one attending the funeral wanted to "rip his face off". Grief marks most of these events, along with the often nearly uncontrollable tears that follow. So one of the comforting words preachers tend to counsel at these events is the idea that the deceased is no longer suffering and God will wipe away their tears in heaven. Is this true? Yes, I am certain of it. But are we to think that God wipes away tears once we get to heaven, but we have to die to experience it? Actually, the teaching that God will wipe away our tears isn't a promise about heaven. It is a promise for now, that extends into the afterlife. This is good news, but stay with me here as we see how it is taught in scripture. First I need to establish a couple ideas then show you the tears that God wipes away are now. So this is an interesting passage. What is happening in this passage in Revelation and in other passages, is that the Second Exodus is taking place. Moses was a type and Jesus is the fulfillment, as he LEADS them out of religion into the safety of relationship. This is not a passage about people IN heaven as we will see. They are sprinkled by the blood (Ex 24:8/7:14) in preparation for God to tabernacle among them. God’s dwelling with them provides food, water, protection, and comfort (Lev 23:40; Rev. 7:9f). Here is what I found really interesting. Most commentators see this multitude as those who are martyrs that died and are standing in heaven worshipping. But that is not what it says. If you notice in the first part of the passage (Rev. 7:1-8, the 144,000) John sees the remnant of natural Israel that is going to be saved from the fall of Jerusalem and they are marked/sealed… where are they? They are on the earth right (the Romans Empire contained about 80 million people where Gentile converts and Jews were spread)? Then John looks immediately and sees a great multitude too who are worshipping before the throne. Unlike Rev. 5 that said in every creature in heaven and earth and below the earth, this just says that they were simply before the throne. Do you remember the prophet Elijah. Notice what is said about him… And Elijah the Tishbite, of the inhabitants of Gilead, said to Ahab, “As the Lord God of Israel lives, BEFORE WHOM I STAND, there shall not be dew nor rain these years, except at my word.” 1 Kings 17:1. Where was Elijah? He was on the earth in a physical body, not technically in heaven correct? Those who were standing before the throne were not in heaven, but they were on earth worshipping before the throne, just like you and I do today. You have to see this passage from God’s point of view. I mean literally. Imagine you are God or that you standing behind the throne of God, looking out and you see angels that are worshipping and you see the multitude of from the nations that are coming to worship Christ. We also know this is true because where was John physically when he was taken to the throne room in the earlier chapters? He was on Patmos. (Is 49:20-22). And in verse 14 the Greek says these are the ones who ARE COMING out of the great tribulation. They have not died yet, they are coming out of religion and the religious system and worshipping Jesus. The Second Exodus was all those coming OUT OF THE RELIGIOUS SYSTEM DURING THE JEWISH TRIBULATION. When Paul wrote to the Colossians he said the hope of the gospel which you heard, which was preached to every creature under heaven, of which I, Paul, became a minister. Again in Romans 1:8, First, I thank my God through Jesus Christ for you all, that your faith is spoken of throughout the whole world. During the Jewish tribulation people were coming to Christ ALL OVER the Roman Empire from vast languages and people groups, not just in Jerusalem. Again notice that the ones before the throne were also physically on the earth because how awkward it would be for the angel to say that God still had not wiped away their tears and was not yet dwelling among them. He says this is future. And each of these promises are quotes from Isaiah 49:8-13 for this life. So there is a promise here of no more hunger, no more thirst, the sun not striking them, nor any heat because Jesus was going to shepherd them and lead them to living fountains of water and the Father was going to wipe away tears. And a promise of dwelling among them in a way he wasn’t quite yet. So there is a promise AFTER AD 70, after the Fall, that God will dwell among them in a special way apparently differently than before. He is God with us! Where is God? Isn't God everywhere already? Yes, but here is the beautiful truth that is missed by futurists. The "coming" of the Lord is the parousia. This word doesn't mean... he was over there but now he is here. It literally means "presence". The point of the "presence" being a near event to them was simply this: once the Jewish temple, Old Covenant system fell, his "presence" would clearly not be mediated through a religious system, but through his direct presence to all people. He would dwell among us ALL, he would be our God and all will be his people it says in Hebrews 8. Christ according to Eph 4 ascended to make possible his "presence" in a way that he would fill all things everywhere with his himself. Not just because he is omnipresent, but in covenant… he is relating to all humanity as their God… even if they are utterly blind to it and have not turned to Jesus yet. Remember, the Law is gone, God was in Christ reconciling the world to himself not counting men’s sins against them. There has never been a time in our lives where God wasn’t relating to us as our Father in heaven, even if we did not believe it yet. There was never a time when you were under Law. Remember in the Exodus how God had the cloud by day and the fire by night? One to remind them of his presence. But secondly it was literally to protect them from the heat of the scorching desert sun. What does that mean for us? It means that God is with us, Emmanuel, God is here… and even when you go through desert places, God is going to be your covering, your God, your shelter in the most high. Everyone's covering, everyone's God, everyone's shelter. You don’t have to abide in the shelter of the most high, the shelter of the most high abides over you! And He will wipe away every tear from their eyes? This is a direct quote from Isaiah 25:7 And He will destroy on this mountain The surface of the covering cast over all people, And the veil that is spread over all nations. 8 He will swallow up death forever, And the Lord God will wipe away tears from all faces; The rebuke of His people He will take away from all the earth; For the Lord has spoken." It is the Law that according to Paul was the veil that blinded and caused a shroud over the eyes of people. Revelation is the "unveliling" of Christ... which is the book about the end of the Law system in AD 70. What veiled Christ? The Law. The removal of the entire system was at the same time the unveiling of Christ! You mean that God isn’t going to wipe away my tears in heaven? Of course he is, but he isn’t limiting it to heaven. That is a given because we know that one day... in his presence there is fullness of joy and at his right hand are pleasures evermore. But wiping away tears begins NOW. So in this Isaiah passage what caused tears? THE LAW! Trying to relate to God through a system that causes blindness and soul-death. For example, remember how Jeremiah wept over the people because of the judgment that was coming, and the sins of the people because of the covenant of Law (Jer. 9:1; Lam 3:48; Jer. 14:17)? The system brought heavy burdens whereas Jesus said, "My yoke is easy and my burden is light." What causes stress? The fear of punishment, the idea that God leaves me when I fail, the false idea that there are covenant curses to punish me when I sin. What causes tears is that we have to figure out the religious formula in order to get God to take away our guilt, or shame. What creates depression is the idea that somehow I am not in a place of ultimate acceptance and belonging in the Father's house. What creates tears is a soul burdened by false beliefs that religion taught them about how to see God or how to see themselves. That is what is ruining lives all across the world! But Jesus has come. He is "present" to all mankind. And the LAW is gone once and for all as a way for men to relate to God. God is among us right now. And the shepherd who is in the midst of the throne, is shepherding you and I and everyone who will listen and notice him… he is leading us to life. One of the ways that he wipes away our tears is that he leads us to the truth of who we are, who HE is. Often people pray and ask God to take away their pain. Then there is no magic that happens and so they think God doesn't care. Others think that since the fruit of the Spirit is joy, that God isn't "in" them since they are feeling grief instead. On the contrary, the WAY that he will take away our tears is by shepherding our hearts back to the truth of who God is, and the truth of who we are in him. This is extremely important because we cannot "see" what we are unwilling to perceive. Once we realize that it is our own beliefs that are the source of our tears... not just the events that initated them, then and only then will we begin to heal. Let me give you an example I heard recently. A woman shared with my wife and I about her husband. Her husband's brother died and since he was taught that his brother went to hell and was being eternally tormented by God, he slipped into a deep depression. In fact, he lost so much weight from the grief that he was down to about 75 lbs and nearly dead himself. Finally, the wife searched out the scriptures and the heart of God and discovered to the relief of them both that the Bible doesn't teach that there is a hell. 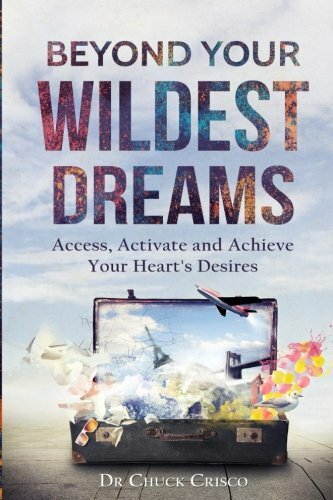 In my latest book, Beyond Your Wildest Dreams: Access, Activate, and Achieve Your Heart's Desires, I write about how to change old beliefs that are hindering us. I want to encourage you to check it out because it will unlock your life as you life in relationship with the God of there here and now. What is God doing in your workplace? He is shepherding you in those relationships! What is God doing in that bad habit that is hurting your marriage? He is giving you hints, he is showing you other ways, he is healing you at the root. He is not far away… he is here right now! It is not a religious system that meets in a building called a church or a mosque or temple that wipes away tears. It is God in relationship with you right now, as the one loving, guiding, and dwelling in you and in your midst! Are you SURE you know who/what satan, devils and demons are? Have you been involved in "spiritual warfare" movements where the more you focus on the devil, the more warfare you actually get or where there is more talk to the devil than Jesus? Did you know that the fields of history are strewn with death and war because they were fathered by false definitions? What if you have been shadow-boxing an enemy that doesn't even exist? I urge you to consider joining me for this special THREE DAY, 3 session conference, that will evaluate many of the myths we have believed while at the same time replacing them with more freedom and joy than you imagined. As a three day conference I am suggesting a minimum donation of $30. As always, if you can't afford it, please contact me at pastorcrisco@hotmail.com for scholarship information. You will be added to a closed Facebook Group within 24 hours where the event will take place. As such I will invite you to the group through your email or watch on Facebook so you can see that I have added you. The videos (3) will be available afterwards to watch if you can't be there at the Live times.